You go to the Lead or Student's Profile > Admissions > Transfer Credits view. You add a transfer institution (that is, the school or organization from which the student wishes to transfer coursework). You add transfer courses and describe how they fit into your own academic programs. At this point, they are considered pending. You can find them both on the profile and in Academics > Reporting > Transfer Credits. When you come to a decision, you approve or reject the transfer courses. 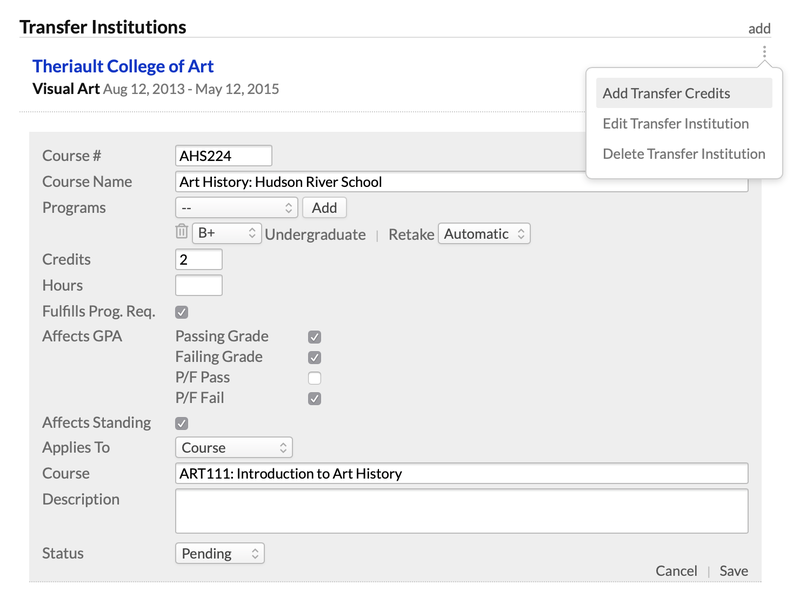 If approved, transfer credits are automatically included in the student's transcript and degree audit as appropriate. They also figure into the student's cumulative GPA, transfer GPA, and cumulative credits/hours. You can also use transfer courses to indicate that a student has taken an AP high school course or has "tested out" of one of your courses. This article describes how to do that (but read this article first). To add transfer credits, start by going to the Profile > Admissions > Transfer Credits view. Click add next to Transfer Institutions. Start typing the institution name. The field will search existing college organizations as you type. If the right school comes up, select it. If not, simply finish typing the institution name. Optionally, enter a Field of Study and a timeframe. For example, the student might have studied Liberal Arts from August 2014 to May 2015. Leave the to field blank to indicate that the timeframe goes up to the present. You can add as many institutions as you need by following the above steps. To start adding transfer courses, click next to the institution name. This process lets you add one, single transfer course. To add additional courses, just repeat these steps as often as you need to. Make sure you enter the right courses under the right institution name! The information you enter here describes how the transfer course fits in to your own academic programs and requirements. Enter the course number and name from the transferring institution (you'll pick your school's course in a few steps). If you do not select a program, this transfer course will not appear on the student's transcript! For each program, select the letter grade from the applicant's transcript or leave it blank (--). This grade is used to calculate the student's transfer GPA (according to the program's grade scale). After you select a grade, select a retake setting (in case the student retakes the course to which you're mapping this transfer course). Automatic treats this course according to the retake policy established in Academic > Settings. Yes or No lets you manually over-ride your standard retake policy regarding the transfer course. Generally speaking, when you first approve a transfer course you'll set this to Automatic; later, if you need to change how it works as a retake, you would come back and change it to Yes or No. Enter the number of units that this course is worth at your school—NOT what it was worth at the transfer school!. You can enter something for all of these fields, or leave some blank. Check off all that apply. Does this course fulfill program requirements? Do passing or failing grades affect the student's GPA? Does it affect the student's standing at your school? Does this transfer course apply to one of your courses or course groups? If a course, start typing your course name or abbreviation and select it from the results. If a course group, select the course group from the drop-down. The description is optional (but can be very useful). Update this as you approve or reject the course. You can also change the status using the function in the Transfer Credits report. Click next to the course you'd like to edit. Change any of the fields you need to update. Update the status when you've decided to approve or reject the course. The effective date refers to the date after which this course would be considered a retake. In the vast majority of cases, you will not need to enter anything in this field, so feel free to ignore it! Remember that changes to transfer courses will affect student degree audits and transcripts! Academics > Reporting > Transfer credits lets you find all transfer courses entered at your school. Click the student's name to go to her Profile > Admissions > Transfer Credits view. Use the filter to sift the report down to show particular kinds of courses. You enter a transfer course during a term with a grade scale defined for that particular term. You want to find transfer courses you entered during the Summer 2015 term. Click Change Statuses to update the status of each course in the report en masse. Export students creates a spreadsheet of the report. Likewise, Email students lets you email the students on the report. If I do these steps AFTER a prospect is made a student, will the process still work? Thanks! These steps will work at any time, including after the Prospect is made a student. Can a student add their own transfer credits for approval? No, that can't be done, and we'd be pretty hesitant to add that sort of functionality. It could open some real cans of worms to let students write and edit that kind of academic info, plus the inevitable headaches involved in having your people check and double-check it would likely prove skull-splitting. Why isn't the student's transcript showing his courses?